The Days of Johann, an agility dog! 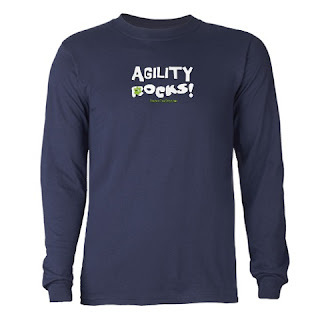 : New agility (flyball, herding and mutts) shirts! New agility (flyball, herding and mutts) shirts! This weekend we got busy again designing a few more new shirts. This time we did some for agility, flyball, herding and mutts. DOG! This is fun and addicting! My favorite design is the new Agility Rocks, 'cause you know how much I love agility. Mum's buying this shirt for herself today - navy blue long sleeve tee. There are three total Agility designs - Agility Rocks! Agility Rules! and I'd rather be playing Agility! All of the designs can be imprinted on a wide variety of items from sweatshirts, to short and long sleeve t-shirts and in lots of colors for women (and plus sizes too :) and men, totebags, water bottles and more. Pretty soon Mum will go crazy and start getting into pet supplies, BOL!!! The flyball design is kinda fun too! It says "I'd rather be playing Flyball!" 'Cause I know anyone who does flyball would rather be doing that than anything else! There are two herding designs - "I'd rather be Herding!" and "Do you know what I Herd?" Hope you like 'em! And if you have a special request for a shirt design, let us know, maybe we can put it all together fur ya!